San Francisco is world-famous for numerous attractions, fine dining, and exquisite shopping. The city offers Pier 39 and Fisherman’s Wharf, Treasure Island, sailing, bay cruises, historic cable cars, Twin Peaks, and much more! See below what San Francisco has to offer. Visit the “crookedest” street in the world while viewing the scenic gardens and iconic views of the bay. Upscale seafood eatery with a raw bar, long wine list in a fanciful undersea-themed décor. Fine Italian classic menu with an assortment of innovative daily specials. Irish bar with pints and hearty grub featuring frequent live music and dueling piano shows. Italian bar and grill using local ingredients with a family atmosphere. Contemporary bistro offering seasonal rustic Italian and French fare. Sophisticated, yet approachable, menu full of contemporary from-scratch New American fare. Wood-fired, thin-crust pizzas and other Italian standards featuring a lively bar scene. The classic comfort and elegance of a traditional steakhouse meal with culinary sophistication. 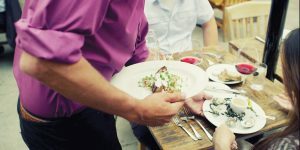 A foodie’s paradise with a collection of boutique restaurants with offerings from exotic to organic. Modern Greek cuisine served with the hospitality of a proper Greek home, luring a chic crowd. Advanced reservations strongly recommended. European inspired restaurant and bar with Italian, Spanish, and Mediterranean cuisine influences, including artisan wood-fired pizzas. Described as the pinnacle of Asian cuisine, Charles Phan’s nationally-acclaimed Vietnamese restaurant is known for using top-quality, local ingredients. Renowned for its delightful crab dishes and distinguished dry-aged steaks. Award winning menu offering acclaimed dry-aged steaks and featuring live jazz in the bar. One of the state’s first locations of this upmarket steakhouse chain known for sizzling, butter-topped beef in an elegant setting. Modern American cuisine served in swanky 1930’s supper club ambiance in a soaring two-story dining room. Bistro style Italian restaurant with traditional pizzas, pasta, and seafood offerings. A classic Italian restaurant serving up ridiculously fresh pastas in simple sauces. The next best thing to eating in Tuscany itself. A fun dining experience renowned for its authentic Tuscan cuisine and included in Wine Spectator’s “America’s Top 100 Wine Lists” with over 500 bottles of wine. Even desserts have garlic at this unique eatery offering delicious, contemporary California-Italian cuisine prepared with and adorned with garlic. A San Francisco landmark serving its famous fresh seafood and Sicilian family recipes for over 90 years. Dine on freshly caught seafood while taking in views of Alcatraz and the Golden Gate Bridge. Enjoy fresh seafood. Shellfish and aged steaks while expansive views of San Francisco Bay. A Tuscan-American eatery with a focus on seafood with rustic, yet chic, décor. Enjoy fresh local mesquite-grilled seafood and award-winning clam chowder with waterfront views of Alcatraz. It can’t get any fresher. This waterfront restaurant serves seafood pulled straight off the pier from local fisherman. Click here to view the top 100 local restaurants published by the San Francisco Chronicle. Calling all shopaholics! The Westfield San Francisco Centre is home to numerous chains including a five-story Nordstroms and just blocks away are famed department stores such as Macy’s, Saks, Neiman Marcus, Nike and Levis. If that isn’t enough, high-end boutique stores including Coach, Bulgari, Cartier, Louis Vuitton, Gucci and many others line the streets. Union square is the Mecca for shopaholics! You won’t need a passport, but once you pass through the Dragon Gates, you will be transported to streets decorated with ornate lampposts and pagoda roofs. Import vendors sell everything from carved Buddhas, paper parasols, jewelry, furniture, and teas to exotic gifts. Be sure to check out the Fortune Cookie Factory tucked away on Ross Alley. 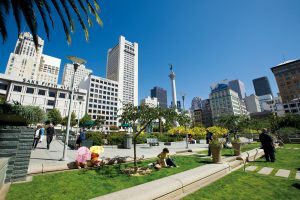 Embarcadero Center is San Francisco’s premier destination for boutique shopping, outstanding restaurants, and popular local events. Be sure to explore the numerous art exhibits, independent film theater, and other onsite attractions. Enjoy stores like Gap, Ann Taylor, See’s Candies, and the SF Giants Dugout. Dive into San Francisco food culture at the Ferry Building Marketplace. Noe Valley is quaint, quiet neighborhood that features a variety of specialized boutique shops. Clothing stores include Isso, Two Birds, Astrid’s Rabat Shoes for Men and Women, Peek-a-Boutique and See Jane Run. This is a great neighborhood to shop for home goods and decor, with stores like Echo Furniture, Global Exchange, Wink and Urban Nest. This street is filled with an eclectic mix of gift shops, restaurants, coffee houses, and well-known retailers such as Chadwick’s of London, Sunglass Hut, and Body Options. Intermingling the shopping experience is a distinctive neighborhood feel. Take a break from shopping and grab a bite to eat or take a coffee break at any of the numerous restaurants or coffee houses and take in some fun people watching.